Statistics of reported criminal activity are kept by Campus Security. Daily activities are summarized and appropriate incidents are reported in detail. In an effort to aid in accurate and reflective statistics, the Hawaiʻi Police Department has assigned a University liaison to relay appropriate information that may not have been reported to Campus Security. As mandated by Federal Legislation, the following statistics are compiled yearly and available upon request from Campus Security and on the Campus Safety and Security Data Analysis Cutting Tool. 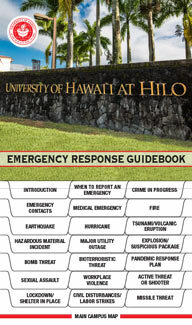 Statistics are available for the UH Hilo Main Campus Stats. View the glossary of case classifications used on these pages.